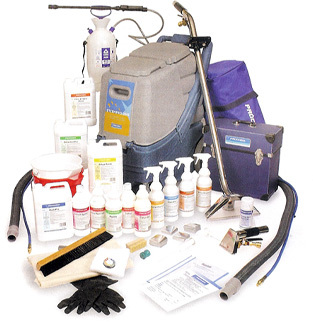 Carpet Steamer or Extractor: This is the main equipment a carpet cleaner needs. It is a portable industrial vacuum machine that holds hot water (usually at least 10 gallons) that is sprayed on a carpet and then it is suctioned by the the vacuum. Rotary Floor Machine: This is a machine that rotates a brush in circular motion. Cleaning chemicals on the carpet are then agitated by the rotator and in turn loosen up the dirt and grime on the carpet. This machine is used mainly by commercial operators during a 2 step process in combination with a carpet extractor. Truck Mounted Carpet Cleaning Machines: This is a powerful vacuum and steamer that is usually mounted on a van. It is much more convenient to operate than a portable carpet extractor and usually yields better results compared to portable units. Chemicals: There are a variety of chemicals used on carpets to clean them. Usually, there is a carpet shampoo to clean all areas. In addition, there are chemicals that are used to treat high traffic areas such as walk paths, work areas, etc.